The resource center housed in Christopher Hall serves as a gateway between the University of Illinois and the local community on autism spectrum disorders for families and professionals. Visitors to the resource center have access to free educational and training materials, and staff consultations. 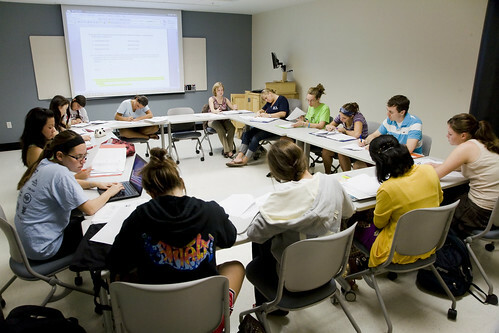 There are three classrooms available to researchers equipped with full audiovisual capabilities and wireless internet access. Additionally, one classroom also has an assistive listening service available for students. The control room houses the video control panel for the observational recording system, which allows up to seven different views of the scene. Split screen, multiple recordings with different views, and close-up recordings can be used for each project, and the recordings can be saved digitally. Three project spaces are available for use by the FRC’s multidisciplinary research teams. Each space is equipped with work stations, secure storage and filing systems, work tables, and telephone network access. The research home is a unique observational facility designed to simulate a family home. Researchers may use the fully equipped kitchen, dining area, living area complete with a television/DVD player, and an adjoining interview room. The observational area is equipped with seven unobtrusive video cameras and seven wired microphones that allow for 360-degree recording of family, couple, and group interactions. Wireless microphones, digital voice recorders, and HD video recorders are also available. Researchers also have access to the studio, a multipurpose meeting space that has full audiovisual and assistive listening capabilities and can serve as an instructional, seminar, and conference space. It houses a portable videoconferencing system and has been equipped with special room darkening shades, portable lighting, wireless internet access, and video cameras.